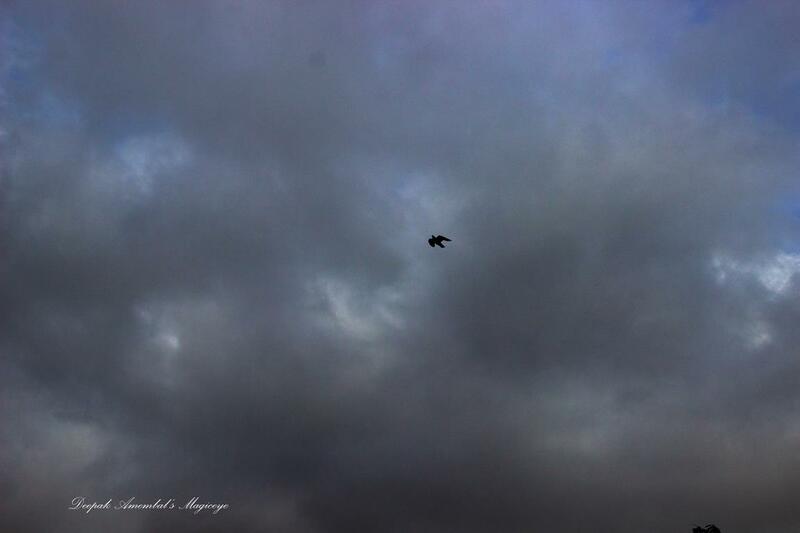 Birdie flying home before it pours. 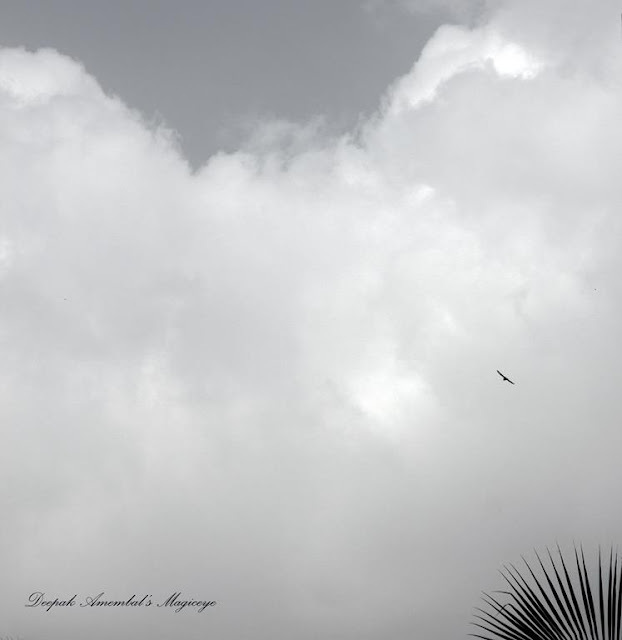 A clouded sky last evening in Bandra east. 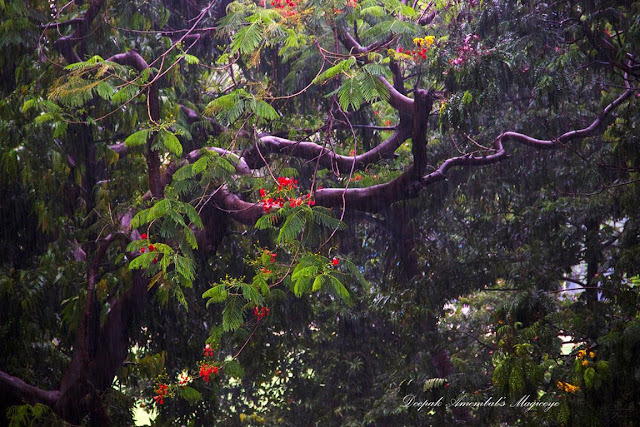 The first rains of the Mumbai monsoons have cleaned the dust off the trees and leaves. 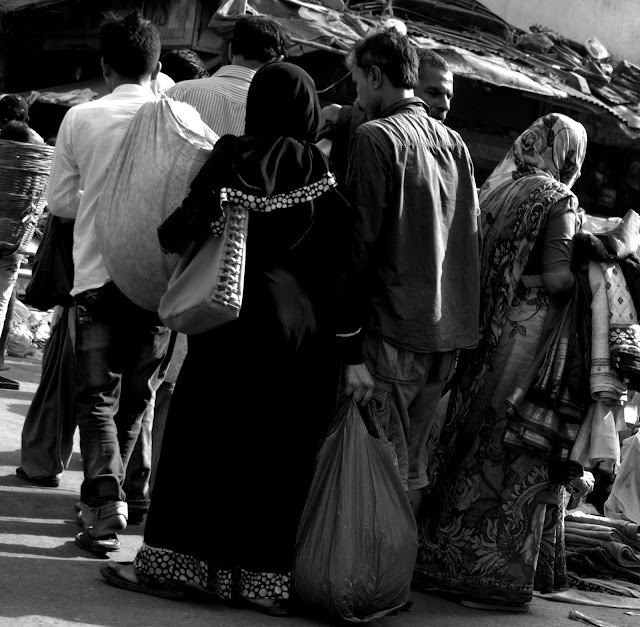 Shopping at the flea market near Null Bazaar. 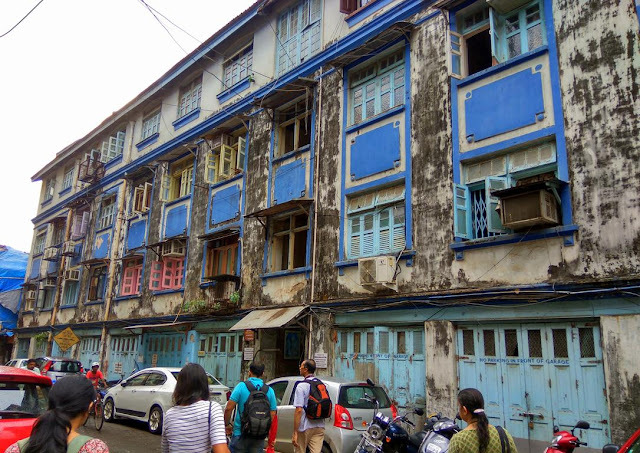 A cute old chawl in Chira Bazaar. 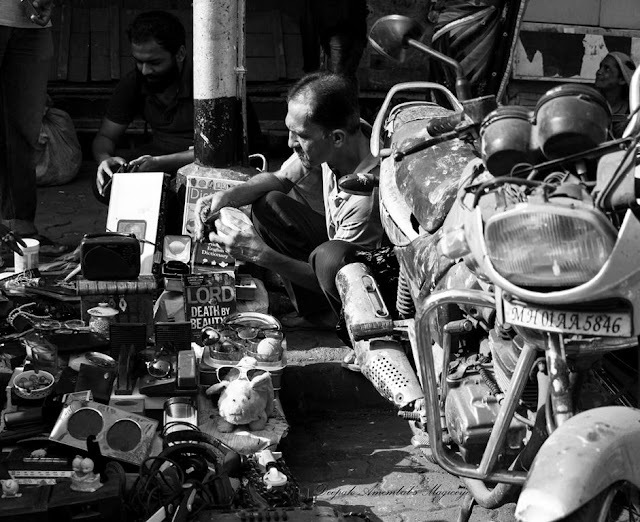 At the flea market in Chor (Thieves) Bazaar. At one of the street food vendors on Mohammed Ali road. An old chawl in St.Francis Xavier Lane in Thakurdwar. 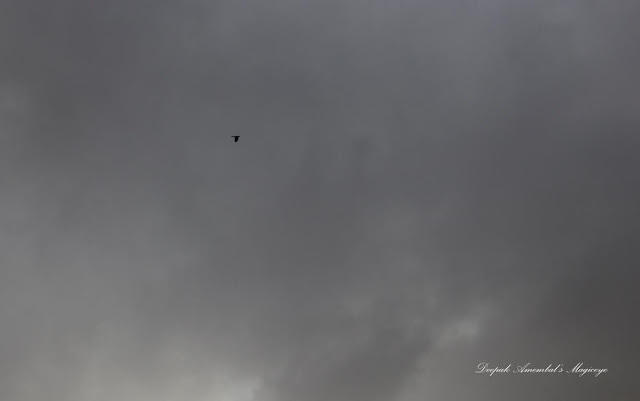 The sky last morning in Bandra east. 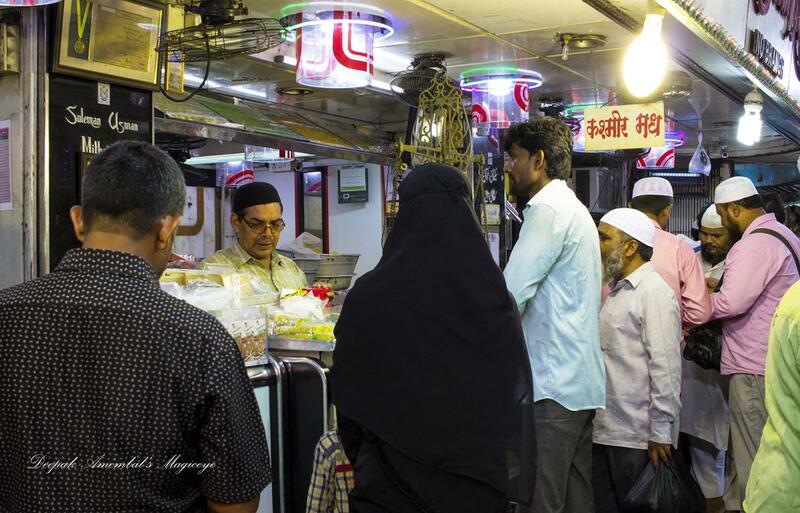 Shopping for sweets outside Minara masjid. 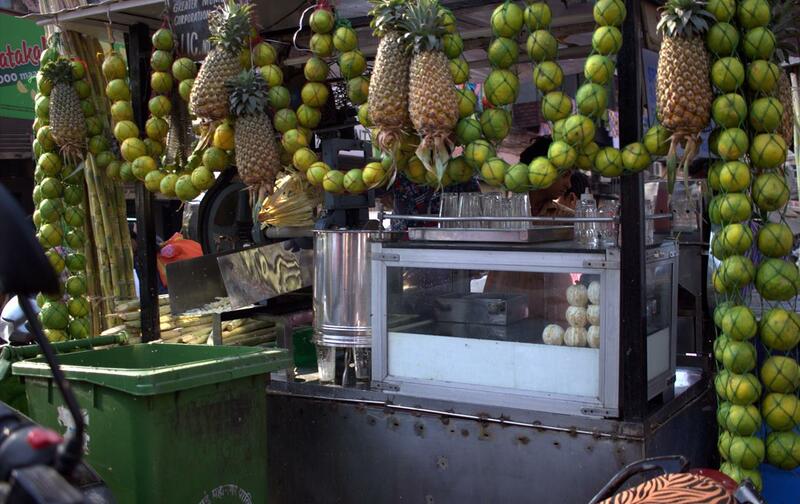 A fruit juice stall to quench the thirst of shoppers on a hot afternoon. 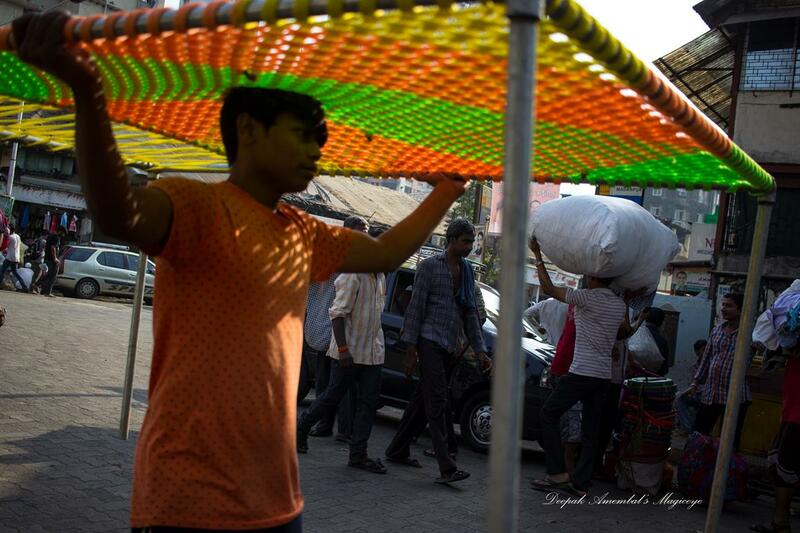 Use as a sun shade in the afternoon and as a bed at night! Smart porter. 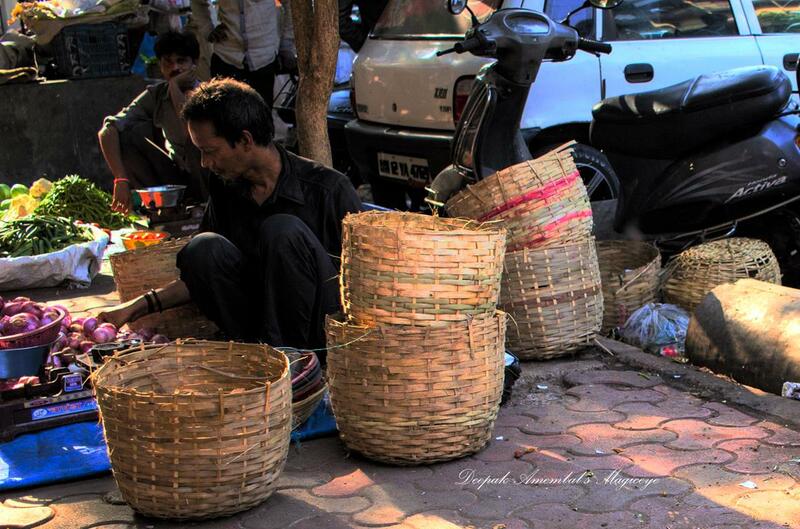 Street entrepreneur fighting the summer heat in the morning at Bhuleshwar market. The old giving way to the new in Girgaon. 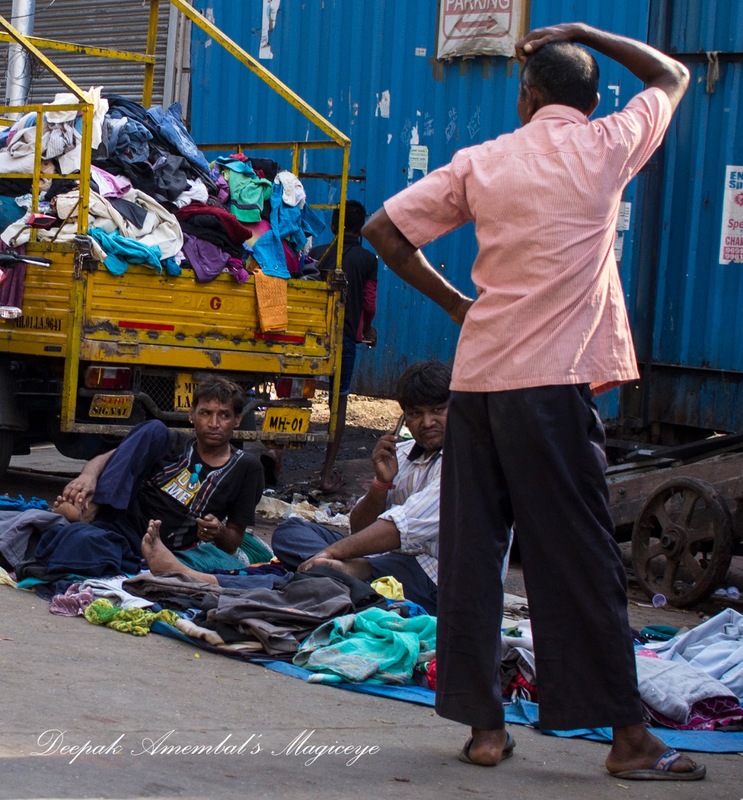 From Bombay to Mumbai. These are Cannons inverted and buried to act as bollards or markers between Zaoba wadi and Navi wadi in Girgaon. 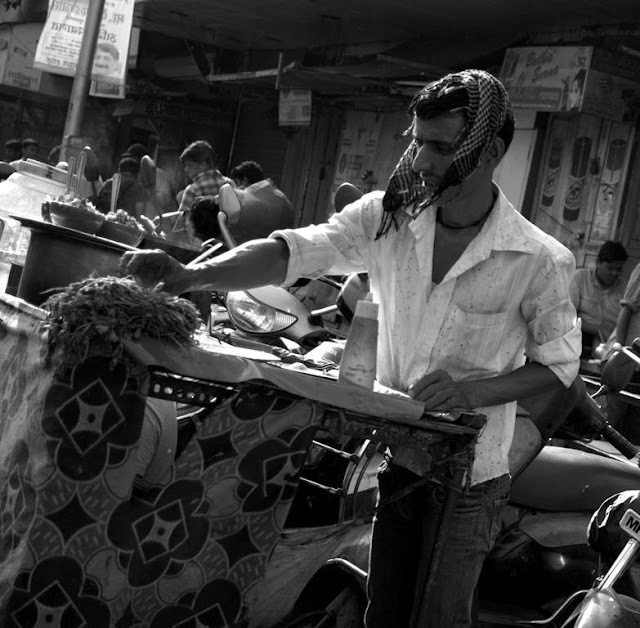 But the local story is that they symbolise the end of strife and beginning of peace. 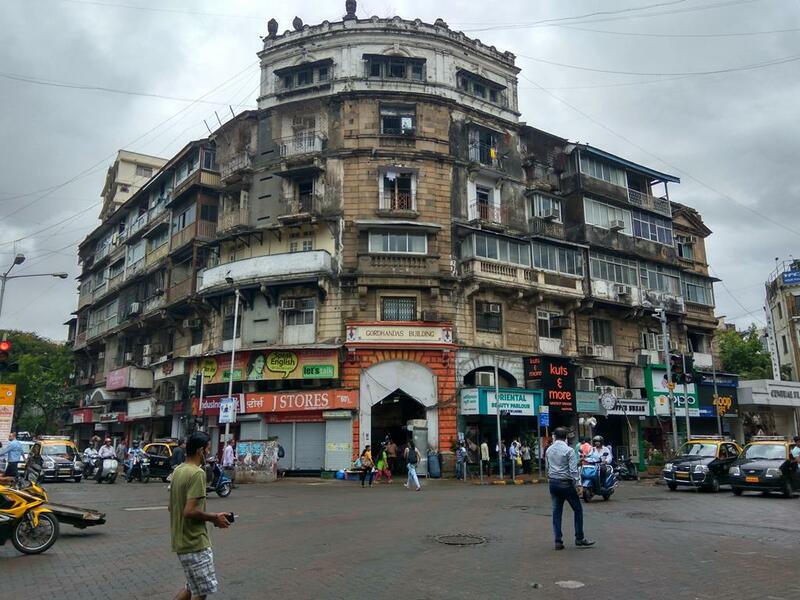 A beautiful old building against a cloudy sky in Girgaon. 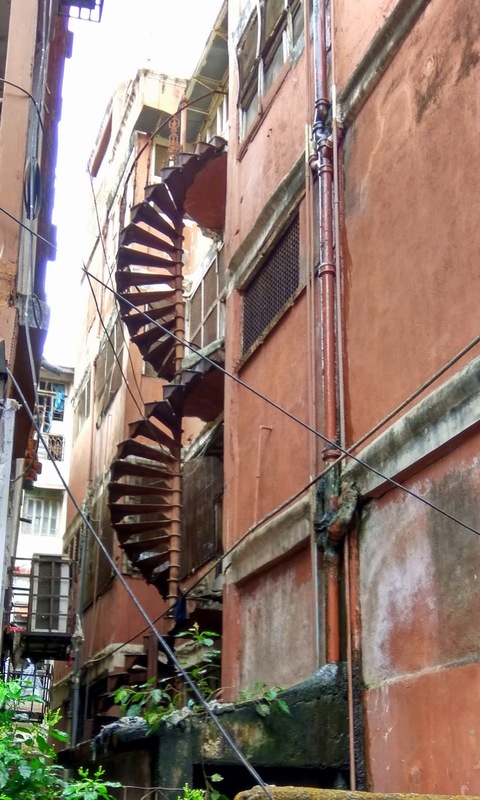 In the olden days domestic help were supposed to use this staircase and enter homes through the back door. This is one of the surviving relics of that period in Chira Bazaar, Girgaon. 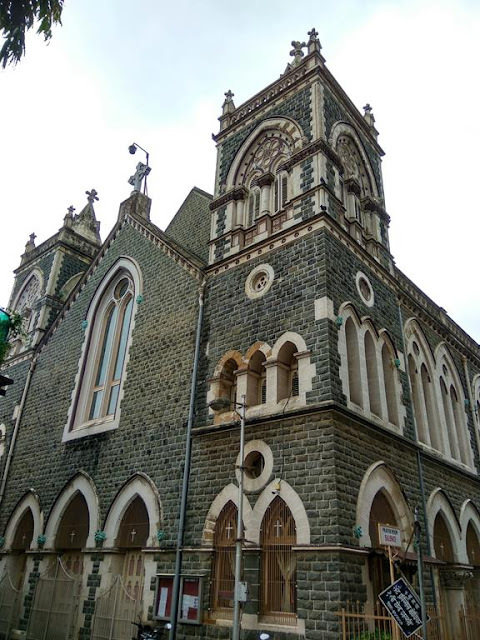 The St.Francis Xavier church, built in 1872 in Dabul, Chira Bazaar, Girgaon, has a bell that dates back to the 18th century and is a relic from a church in Vasai (Bassein) fort. Thank you Siddhartha for the valuable information. 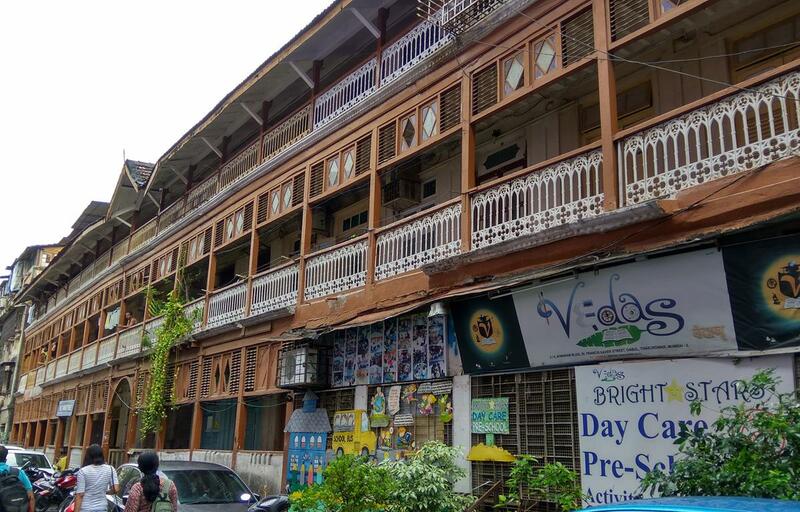 The Students' Literary and Scientific Society's Girls' High School also called Kamalabai Brahmankar Shala, after its popular principal, opened in 1848. It was the 1st high school in Bombay for girls. In 1884 the school moved to the present premises. 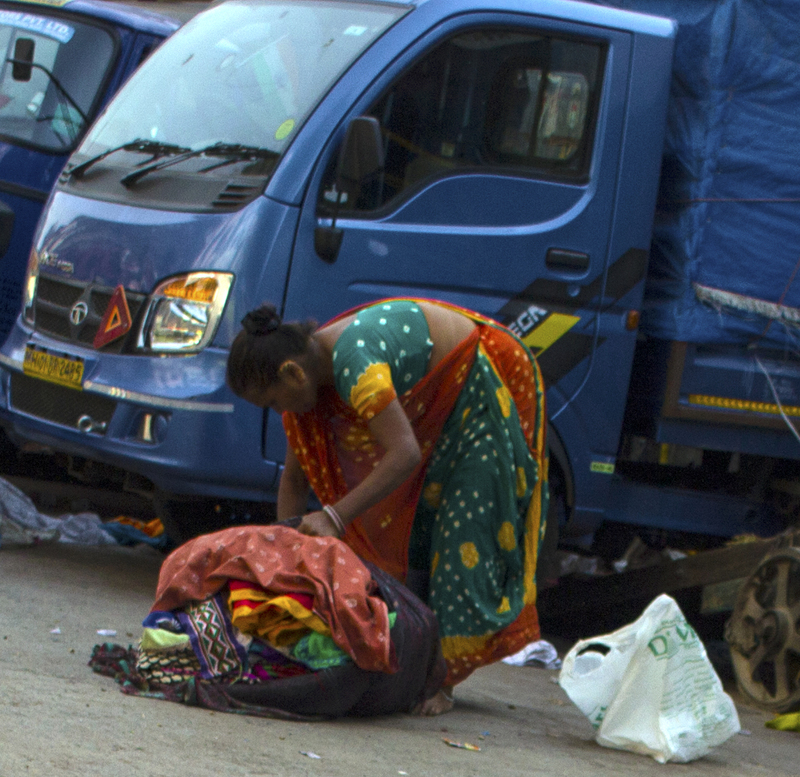 This shows that education for girls was of great importance and was encouraged in Maharashtra in those days. 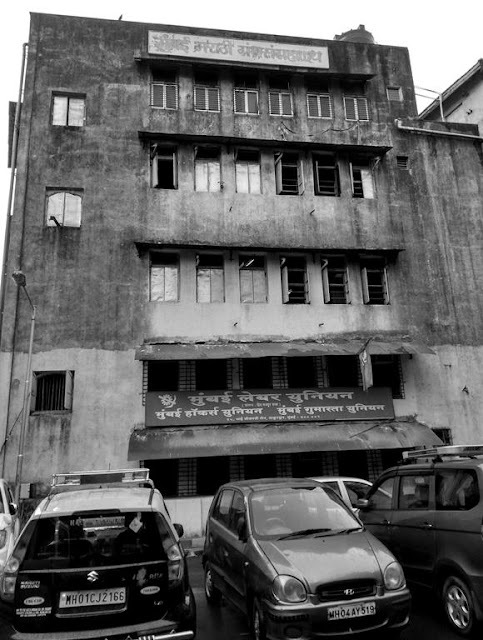 The Mumbai Marathi Granth Sanghralay,in Girgaon, was founded on 01Aug1898 by MB Gurjar, NM Joshi, Shridhar Modak and Anant Pithkar, who were the educated elite of India those days. 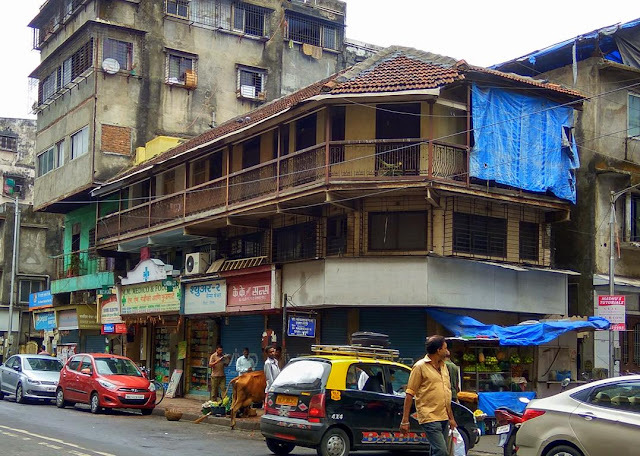 They started this repository of Marathi literature to satiate the thirst of the vast populace who had nowhere to go to access fine Marathi literature. Today the books there are used for research by scholars. 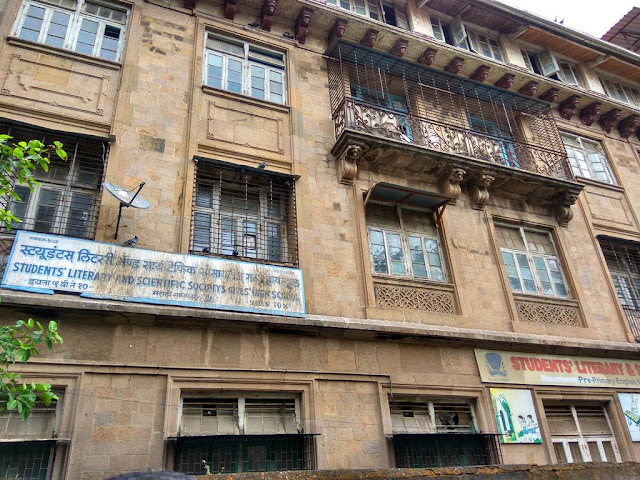 The building has undergone a lot of changes since inception but remains true to its original purpose of literary education of the masses. This information was provided to me by Siddhartha of Awestrich who took us on a walking tour of Girgaon. 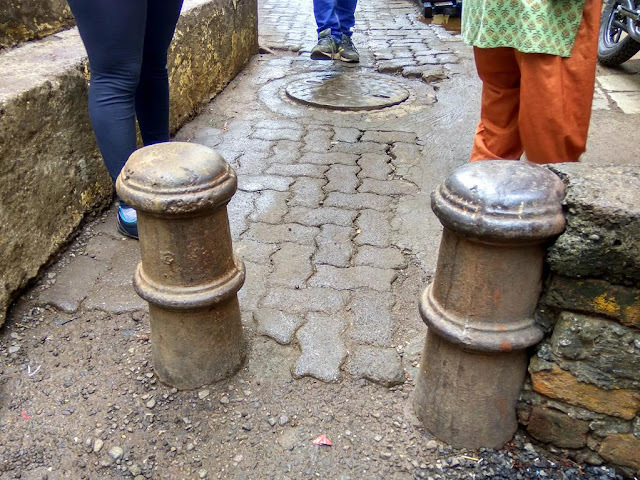 Thank you Awestrich for inviting me to this wonderful walk chronicling Girgaon by the well informed tour leader Siddartha. Learnt a lot about the cultural and historical heritage of Girgaon. 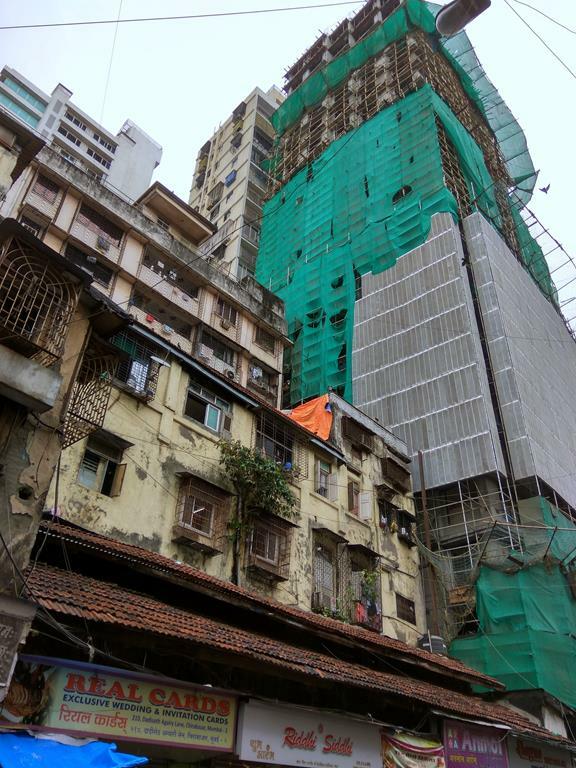 Walking through Girgaon is literally a walk back in time. 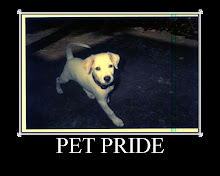 Shall post a few pictures of the walk this week. The Sanskrit term "Giri" stands for hills and "gram" denotes a village. Thus, Girgaon means a village at the foothill of mountains. The hill referred to here, is the Malabar Hill, which is about 4kms away. 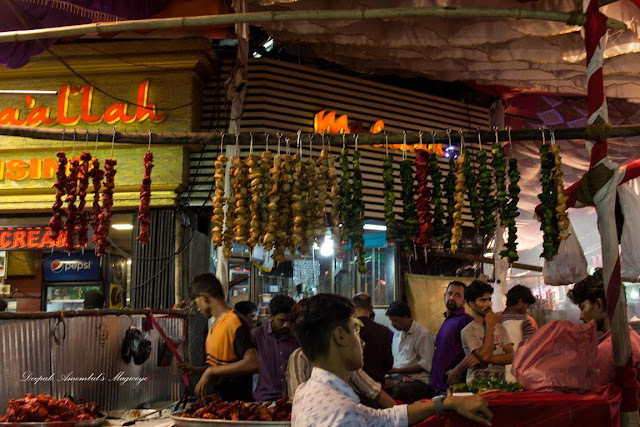 Colourful kababs on display in a stall outside Minara masjid on Mohammed Ali road. 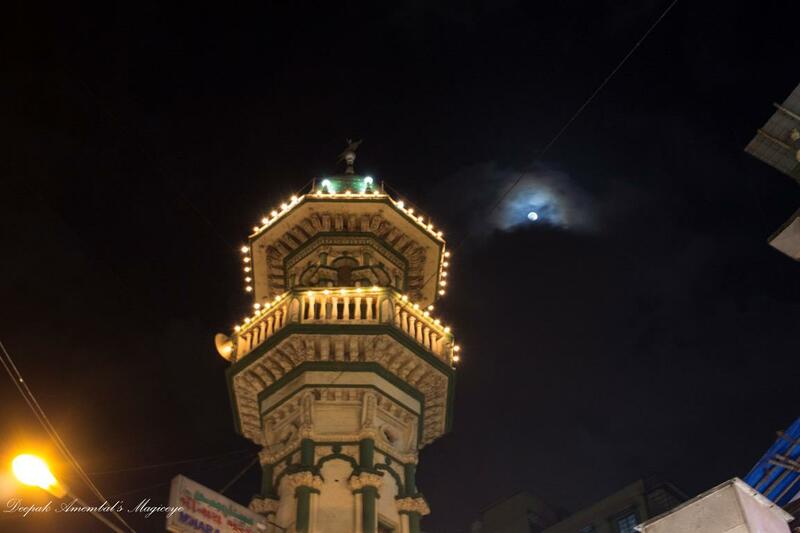 A minaret of the Minara masjid piercing a cloudy sky to be with the moon. 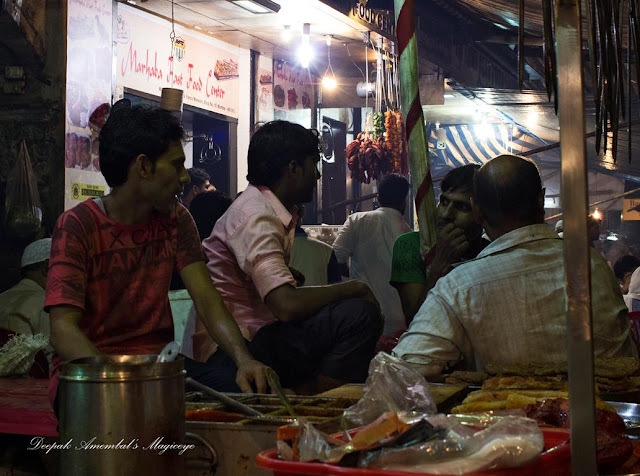 Mohammed Ali road, around Minara masjid, turns into a street food fest at night during Ramzan when the Muslims fast from sunrise to sunset. 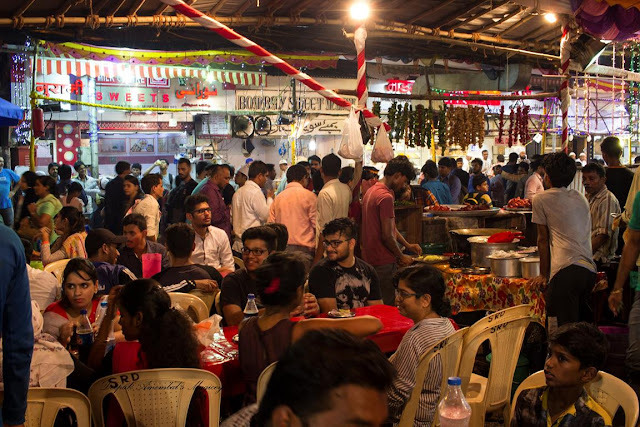 What was originally a place for Muslims to break their fast after their evening prayer has turned into a full fledged street food fest for all foodies in Mumbai. Getting ready to hawk on the streets of Mumbai. Family that shops together stays together! 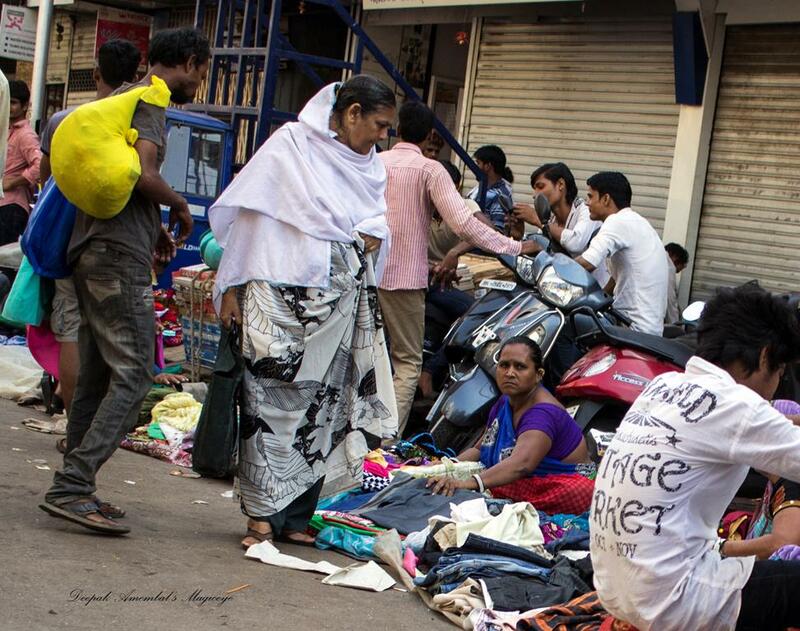 Street shopping in Kumbharwada. 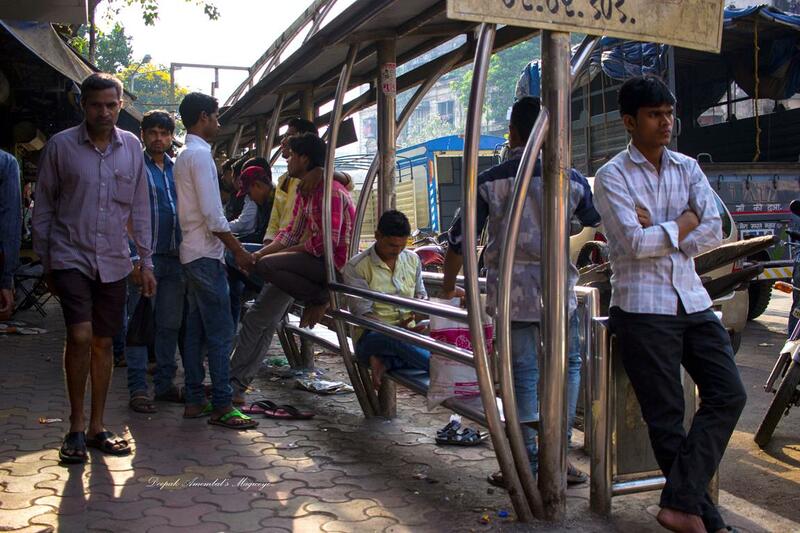 Sunday morning at the bus stop in South Mumbai. Setting up 'shop' on the pavement in Bhuleshwar market in South Mumbai. 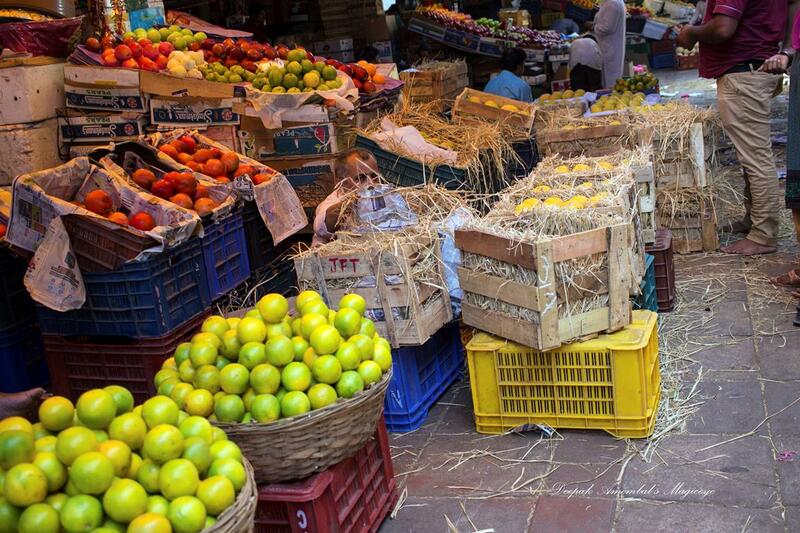 Nature's bounty at the erstwhile Crawford market rechristened as Mahatma Jyotiba Phule Mandai.